Apple pie. Is there anything better in life? Just the aroma of one baking can brighten your day. Anyone can go to their local grocer or baker and pick up an apple pie, but can you bake one yourself from scratch? While to some this may seem to be an insurmountable task, it really isn’t as difficult as you may think. While the majority of these recipes are devised and written by Tinsley, here’s one that I (Jason) came up with and have perfected over the years. If I can do it, then you definitely can! There are two parts to this recipe (crust and pie) and it will take two days if you want to do it correctly. I promise it’s worth the extra time. Start by combing the flour and salt in a large mixing bowl. Cut in the butter (or you can use shortening) until the mixture looks like coarse crumbs. Stir in the 1/2 cup of water until the dough forms a ball. Then divide your dough in half, reshape it into balls - one will be your crust and one will be the pie top. Wrap the two dough balls in plastic wrap and refrigerate overnight (or at least 4 hours if you’re short on time). When you’re ready to use the crust, simply roll it out on a flour covered counter. Try not to over work it. If you prefer a sweeter crust, add a little bit of sugar to the original dough mix. Start by preheating your oven to 450. 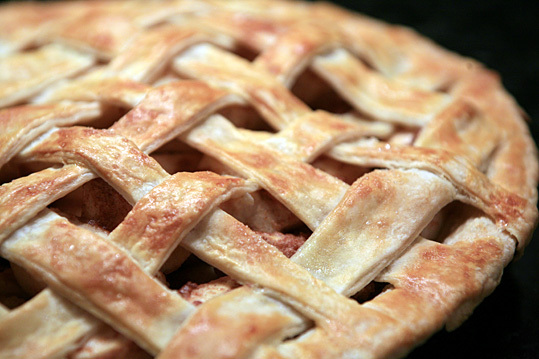 Roll out your pie crust to a circle shape larger than your pie pan, then gently place it in the pie pan. In a mixing bowl, mix the sugar, flour, salt, cinnamon and nutmeg. Place your sliced apples in the bowl and cover with the sugar mixture – toss until thoroughly coated. Spoon or dump the covered apples into your pie pan. Sometimes I add a couple of dabs of butter to the tops of the apples, but it isn’t required (half the time I forget). Roll out your other dough ball into a circle shape larger than your pie pan, then gently place it on top of the pie. Trim the excess dough (scissors work well), then crimp the edges to seal. Cut a couple of steam vents in the top – be creative with your design. Bake in 450 degree preheated oven for 10 minutes. THEN lower the temperature to 350 and bake for an additional 40 minutes. 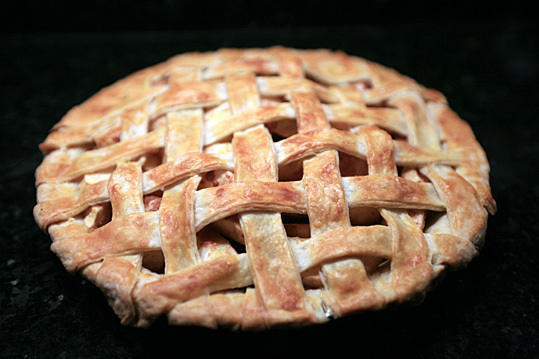 How do you make a pie crust like the one pictured here? When you roll out your dough, take a pizza cutter and cut the circle into long strips. Place the strips one at a time on top of the pie, making sure you weave the dough strips. Take a little bit of egg wash (egg + water, beaten) and brush it on the top to give it the nice golden color. Sprinkle some sugar (the RAW sugar works best – the color matches the pie and it’s a chunkie sugar, so you can see it) on top before it bakes.